The New England Patriots and Philadelphia Eagles are suffering some similar issues as they face off against each other this weekend. Both sides look likely to play each other without key players on both sides of the football. Wide receivers Jeremy Maclin and Chad Ochocinco, even if he is not a key player, both look set to miss out as Maclin is listed as doubtful and Ochocinco has already been ruled out. Dominique Rodgers Cromartie returned to limited practice on Friday but will be a major shock if he is in pads today. Nnamdi Asomugha went down with a knee injury during practice this week, and while it is not considered a serious problem, he is listed as questionable. The Patriots are also missing two players from a problematic secondary. Their struggles may be even greater however as Pat Chung and Devin McCourty are the team's best secondary players. Both Chung and McCourty have been ruled out. McCourty will be replaced by Antwuan Molden, a waiver wire addition, while Chung will be replaced by Sterling Moore. Without McCourty and Chung, the home side will be hoping to put up big numbers through the air, however they will need to do so not only without a starting receiver, Maclin, but also without their starting quarterback. Michael Vick is unlikely to play again this week after missing practice. 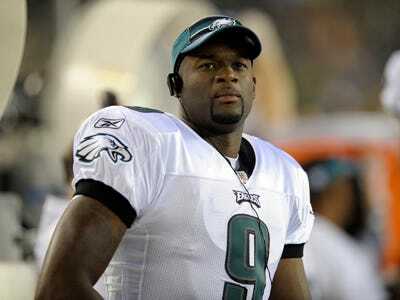 The Eagles will instead turn to Vince Young again, hoping he can lead the team to another victory as he did against the Giants. Young wasn't 100 percent comfortable in the system last week and will only get better the more he plays. However that change won't be drastic with just a weeks practice. He has never been a great passer of the ball but does have similar traits to Michael Vick as a dual threat quarterback. He will certainly be capable of picking apart a Patriots' secondary that is at best an average group. The Eagles main focus should stay on putting the ball in LeSean McCoy's hands however. Despite Andy Reid's reluctance to run the ball, McCoy is the biggest weapon on the Eagles' offense and will prove problematic for the Patriots' defense to shut down. McCoy is averaging 24 carries per game in Eagles' victories this season, including 23 for 113 last week against the Giants. Keeping McCoy in check and forcing the game into Young's hands, despite the team's secondary issues, is the best way for the Patriots to beat the Eagles. Young may have won last week but he also threw three interceptions. On the other side of the ball, I said the Patriots were missing key players on both sides, and the key player on offense isn't Chad Ochocinco. Center Dan Connolly, who is already starting in place of Dan Koppen who was lost for the season, won't play in Philadelphia. Connolly had been a solid starter for the team since moving from backup guard to starting center earlier in the year. Today is one day when the team would have wanted its best linemen available to handle the fearsome Eagles' front four. Without Connolly, and potentially without Matt Light, the Patriots will struggle to keep Trent Cole, Jason Babin and Cullen Jenkins from getting to Tom Brady. Cullen Jenkins will be the key performer for the Eagles as Brady struggles to cope with pressure up the middle. Jenkins is arguably the best interior pass rusher in the league. He will be a huge test for Brian Waters and Logan Mankins inside, to the point that this matchup could decide the game. The Philadelphia Eagles and New England Patriots are both wounded animals, but the Eagles are also backed into a corner with their playoffs beginning last week. Today will be a tough trip for the Patriots as they look to escape Philadelphia with a victory.